The Great Railroad Strike of 1877 sometimes referred to as the Great Upheaval, began on July 14 in Martinsburg, West Virginia, United States after the Baltimore and Ohio Railroad (B&O) cut wages for the third time in a year. This strike finally ended some 45 days later, after it was put down by local and state militias, and federal troops. Because of economic problems and pressure on wages by the railroads, workers in numerous other cities, in New York, Pennsylvania and Maryland, into Illinois and Missouri, also went out on strike. An estimated 100 people were killed in the unrest across the country. In Martinsburg, Pittsburgh, Philadelphia and other cities, workers burned down and destroyed both physical facilities and the rolling stock of the railroads—engines and railroad cars. Local populations feared that workers were rising in revolution such as the Paris Commune of 1871. At the time, the workers were not represented by trade unions. The city and state governments organized armed militias, aided by national guard, federal troops and private militias organized by the railroads, who fought against the workers. Disruption was widespread and at its height, the strikes were supported by about 100,000 workers. With the intervention of federal troops in several locations, most of the strikes were suppressed by early August. Labor continued to work to organize into unions to work for better wages and conditions. Fearing the social disruption, many cities built armories to support their militias; these defensive buildings still stand as symbols of the effort to suppress the labor unrest of this period. With public attention on workers' wages and conditions, the B&O in 1880 founded an Employee Relief Association to provide death benefits and some health care. In 1884 it established a worker pension plan. Other improvements generally had to await further economic growth and associated wage increases. When the Civil War ended, a boom in railroad construction ensued, with roughly 55,000 kilometers (35,000 miles) of new track being laid from coast-to-coast between 1866 and 1873. The railroads, then the second largest employer outside of agriculture, required large amounts of capital investment, and thus entailed massive financial risk. Speculators fed large amounts of money into the industry, causing abnormal growth and over-expansion. Jay Cooke's firm, like many other banking firms, invested a disproportionate share of depositors' funds in the railroads, thus paving the way for the ensuing collapse. In addition to Cooke's direct infusion of capital in the railroads, the firm had become a federal agent for the government in the government's direct financing of railroad construction. As building new track in areas where land had not yet been cleared or settled required land grants and loans that only the government could provide, the use of Jay Cooke's firm as a conduit for federal funding worsened the effects that Cooke's bankruptcy had on the nation's economy. In the wake of the Panic of 1873, a bitter antagonism between workers and the leaders of industry developed. Immigration from Europe was underway, as was migration of rural workers into the cities, increasing competition for jobs and enabling companies to drive down wages and easily lay off workers. By 1877, 10 percent wage cuts, distrust of capitalists and poor working conditions led to workers conducting numerous railroad strikes that prevented the trains from moving, with spiraling effects in other parts of the economy. Suppressed by violence, workers continued to organize to try to improve their conditions. Management worked to break up such movements, and mainstream society feared labor organizing as signs of revolutionary socialism. Tensions lingered well after the depression ended in 1878–79. Many of the new immigrant workers were Catholics, and their church had forbidden participation in secret societies since 1743, partially as a reaction against the anti-Catholicism of Freemasonry. But by the late 19th century, the Knights of Labor, a national and predominately Catholic organization, had 700,000 members seeking to represent all workers. In 1888 Archbishop James Cardinal Gibbons of Baltimore sympathized with the workers and collaborated with other bishops to lift the prohibition against workers joining the KOL. Other workers also took actions, and unrest marked the following decades. In 1886 Samuel Gompers founded the American Federation of Labor for the skilled craft trades, attracting skilled workers from other groups. Other labor organizing followed. The Great Railroad Strike of 1877 started on July 14 in Martinsburg, West Virginia, in response to the Baltimore & Ohio Railroad (B&O) cutting wages of workers for the third time in a year. Striking workers would not allow any of the trains, mainly freight trains, to roll until this third wage cut was revoked. West Virginia Governor Henry M. Mathews sent in state militia units to restore train service but the soldiers refused to fire on the strikers. The governor in Charleston, West Virginia then appealed for federal troops. Meanwhile, the Strike also spread into western Maryland to the major railroad hub of Cumberland, county seat of Allegany County where railway workers stopped freight and passenger traffic. In Baltimore with the famous Fifth ("Dandy Fifth") and Sixth Regiments of the former state militia, now reorganized since the war as the Maryland National Guard were also called up by 37th Maryland Governor John Lee Carroll, (1830-1911), in Annapolis at the request of powerful B. & O. President John Work Garrett, (1820-1884). The Fifth marched down North Howard Street from their armory above the old Richmond Market (at present North Howard and West Read Streets) in the Mount Vernon-Belvedere neighborhood and were generally unopposed heading south for the B. & O. 's general headquarters and main depot at the Camden Street Station to board the waiting westward trains to Hagerstown and Cumberland. But the unfortunate Sixth assembled at their armory at East Fayette and North Front Streets (by the old Phoenix Shot Tower) in the Old Town /Jonestown area and had to fight their way west through regular sympathetic Baltimore citizens, rioters and striking workers which erupted into bloodshed along main downtown commercial thoroughfare of Baltimore Street to get to Camden. It was a horrible scene reminiscent of the worst of the bloody "Pratt Street Riots" of the Civil War era disturbances of April 1861, over 15 years earlier of the "first bloodshed" of the war. When the outnumbered troops of the 6th Regiment finally fired volleys on an attacking crowd on Baltimore Street, they killed 10 civilians and wounded 25. The rioters injured several members of the militia, damaged B. & O. engines and train cars, and burned portions of the train station at South Howard and West Camden Streets. The militia remained trapped in the surrounding Camden Yards, besieged by armed rioters until July 21–22, when the 19th President Rutherford B. Hayes sent federal troops and the U.S. Marines to Baltimore to restore order. There were strike actions also further north in Albany, Syracuse and Buffalo, New York on other railroad lines. Workers in the cities in industries other than railroads still attacked them because of how they cut through the cities and dominated city life. Their resentment of the railroads' economic power was expressed in physical attacks against them at a time when many workers' wages were lowered. Protestors "included cross-class elements from other work sites, small businesses, and commercial establishments. Some protestors acted out of solidarity with the strikers, but many more vented militant displeasure against dangerous railroad traffic that crisscrossed urban centers in that area." Pittsburgh, Pennsylvania became the site of the worst violence of related strikes. Thomas Alexander Scott of the Pennsylvania Railroad, described as one of the first robber barons, suggested that the strikers should be given "a rifle diet for a few days and see how they like that kind of bread." As in some other cities and towns, local law enforcement officers such as sheriffs, deputies and police refused to fire on the strikers. Several state militia units were ordered into service by Governor John Hartranft, including the 3rd Pennsylvania Infantry Regiment under the command of Colonel George R. Snowden. On July 21, militiamen bayoneted and fired on rock-throwing strikers, killing 20 people and wounding 29. 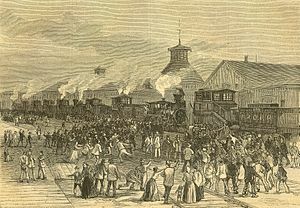 Rather than quell the uprising, these actions infuriated the strikers, who retaliated and forced the militia to take refuge in a railroad roundhouse. Strikers set fires that razed 39 buildings and destroyed rolling stock: 104 locomotives and 1,245 freight and passenger cars. On July 22, the militia mounted an assault on the strikers, shooting their way out of the roundhouse and killing 20 more people on their way out of the city. After more than a month of rioting and bloodshed in Pittsburgh, President Rutherford B. Hayes sent in federal troops as in West Virginia and Maryland to end the strikes and strife. Three hundred miles to the east, Philadelphia strikers battled local militia and set fire to much of Center City before Pennsylvania Governor John Hartranft gained assistance and federal troops from President Hayes to put down the uprising. Workers in Reading, Pennsylvania's third-largest industrial city at the time, also broke out into a strike. This city was home of the engine works and shops of the Reading Railroad, against which engineers had struck since April 1877. State militia shot 16 citizens. Preludes to the massacre included: fresh work stoppage by all classes of the railroad's local workforce; mass marches; blocking of rail traffic; and trainyard arson. 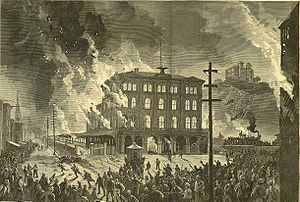 Workers burned down the only railroad bridge offering connections to the west, in order to prevent local militia from being mustered to actions in the state capital of Harrisburg or Pittsburgh. Authorities used state militia, local police and the Pennsylvania Pinkerton National Detective Agency in an attempt to break the strike. Reading Railroad management mobilized a private militia, which members committed the shootings in the city. This militia was not mobilized by local public officials. On July 25, 1000 men and boys, many of them coal miners, marched to the Reading Railroad Depot in Shamokin, east of Sunbury along the Susquehanna River valley. They looted the depot when the town announced it would pay them only $1/day for emergency public employment. The mayor, who owned coal mines, organized a city militia. It committed 14 civilian shooting casualties, resulting in the deaths of two persons. On August 1, 1877, in Scranton in northeast Pennsylvania, one day after railroad workers conceded a strike, a city posse of 51 men armed with new rifles and under the command of William Walker Scranton, general manager of the Lackawanna Iron & Coal Company, returned fire at a group of rioters, strikers, and, most likely, bystanders. The posse killed or fatally wounded four and wounded an undetermined number of others, estimated at 20 to 50, according to different sources. Pennsylvania Governor Hartranft declared Scranton to be under martial law; it was occupied by state and federal troops armed with Gatling guns. Later the posse leader and about 20 of his men were charged with assault and murder. They were all acquitted. Under the effects of the shootings and military occupation, the miners ended their strike without gaining any of their demands. On July 24, rail traffic in Chicago was paralyzed when angry mobs of unemployed citizens wreaked havoc in the rail yards, shutting down both the Baltimore and Ohio and the Illinois Central railroads. Soon, other railroads throughout the state were brought to a standstill, with demonstrators shutting down railroad traffic in Bloomington, Aurora, Peoria, Decatur, Urbana and other rail centers throughout Illinois. In sympathy, coal miners in the pits at Braidwood, LaSalle, Springfield, and Carbondale went on strike as well. In Chicago, the Workingmen's Party organized demonstrations that drew crowds of 20,000 people. Judge Thomas Drummond of the United States Court of Appeals for the Seventh Circuit, who was overseeing numerous railroads that had declared bankruptcy in the wake of the earlier financial Panic of 1873, ruled that "A strike or other unlawful interference with the trains will be a violation of the United States law, and the court will be bound to take notice of it and enforce the penalty." Drummond told the U.S. Marshals to protect the railroads, and asked for federal troops to enforce his decision: he subsequently had strikers arrested and tried them for contempt of court. The Mayor of Chicago, Monroe Heath, recruited 5,000 men as volunteer militia, asking for help in restoring order. They were partially successful, and shortly thereafter were reinforced by the arrival of the Illinois National Guard and U.S. Army troops, mobilized by the governor. On July 25, violence between police and the mob erupted, with events reaching a peak the following day. 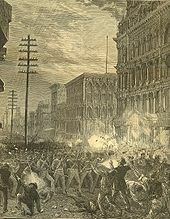 These blood-soaked confrontations between police and enraged mobs are known as the Battle of the Viaduct as they took place near the Halsted Street viaduct, although confrontations also took place at nearby 16th Street, on 12th, and on Canal Street. The headline of the Chicago Times screamed, "Terrors Reign, The Streets of Chicago Given Over to Howling Mobs of Thieves and Cutthroats." Order was finally restored. An estimated 20 men and boys died, none of whom were law enforcement or troops; scores more were wounded; and the loss of property was valued in the millions of dollars. On July 21, disgruntled workers in the industrial rail hub of East St. Louis, Illinois, halted all freight traffic, with the city remaining in the control of the strikers for almost a week. The St. Louis Workingman's Party led a group of approximately 500 men across the Missouri River in an act of solidarity with the nearly 1,000 workers on strike. It was a catalyst for labor unrest spreading, with thousands of workers in several industries striking for the eight-hour day and a ban on child labor. This was the first such general strike in the United States. The strike on both sides of the river was ended after the governor appealed for help and gained the intervention of some 3,000 federal troops and 5,000 deputized special police. These armed forces killed at least eighteen people in skirmishes around the city. On July 28, 1877, they took control of the Relay Depot, the Commune's command center, and arrested some seventy strikers. The Great Railroad Strike of 1877 began to lose momentum when President Hayes sent federal troops from city to city. These troops suppressed strike after strike, until at last, approximately 45 days after it had started, the Great Railroad Strike of 1877 was over. After the Great Railroad Strike of 1877, union organizers planned for their next battles while politicians and business leaders took steps to prevent a repetition of this chaos. Many states enacted conspiracy statutes. States formed new militia units and constructed National Guard armories in numerous industrial cities. For workers and employers alike, the strikes had shown the power of workers in combination to challenge the status quo. A state militiaman in Pittsburgh, ordered to break the 1877 strike, pointed out that the workers were driven by "one spirit and one purpose among them -– that they were justified in resorting to any means to break down the power of the corporations." Unions became better organized as well as more competent, and the number of strikes increased. The Knights of Labor grew to be a national organization of predominately Catholic workers, numbering 700,000 by the early 1880s. In the 1880s nearly 10,000 strike actions and lockouts took place. In 1886 nearly 700,000 workers went on strike. Business leaders strengthened their opposition to the unions, often firing men who tried to organize or join them. Nonetheless, the labor movement continued to grow. One result of the strike was increased public awareness of the grievances of railroad workers. On May 1, 1880, the B&O Railroad, which had the lowest wage rate of any major railroad, established the Baltimore and Ohio Employees' Relief Association, which provided coverage for sickness, injury from accidents, and a death benefit. In 1884, the B&O became the first major employer to offer a pension plan. In 2003 the Baltimore and Ohio Railroad Martinsburg Shops, where the strike began, were declared a National Historic Landmark. The first national strike began July 16, 1877, with Baltimore and Ohio Railroad workers in Martinsburg, West Virginia, and Baltimore, Maryland. It spread across the nation halting rail traffic and closing factories in reaction to widespread worker discontent over wage cuts and conditions during a national depression. Broken by Federal troops in early August, the strike energized the labor movement and was precursor to labor unrest in the 1880s and 1890s. Another was placed in 1978 in Martinsburg, WV by the West Virginia Department of Culture and History. ^ "Business Cycle Expansions and Contractions". National Bureau of Economic Research. Archived from the original on September 25, 2008. Retrieved April 3, 2009. ^ Fels, Rendigs (1949). "The Long-Wave Depression, 1873-79". The Review of Economics and Statistics. 31 (1): 69–73. doi:10.2307/1927196. JSTOR 1927196. ^ Masur, Gerhard (1970). Imperial Berlin. New York: Basic Books. ISBN 0465032095. ^ a b c Philip Mark Katz (1998). Appomattox to Montmartre: Americans and the Paris Commune. Harvard University Press. ISBN 0-674-32348-3. ^ Paul Kleppner, "The Greenback and Prohibition Parties," in Arthur M. Schlesinger (ed. ), History of U.S. Political Parties: Volume II, 1860–1910, The Gilded Age of Politics. New York: Chelsea House/R.R. Bowker Co., 1973; pg. 1556. ^ David Glasner, Thomas F. Cooley (1997). "Depression of 1873-1879". Business Cycles and Depressions: An Encyclopedia. Taylor & Francis. ISBN 0-8240-0944-4. ^ a b Scharf, J. Thomas (1967) [1st. Pub. 1879]. "History of Maryland From the Earliest Period to the Present Day". 3. Hatboro, PA: Tradition Press: 733–42. ^ Ingham, John N., Biographical Dictionary of American Business Leaders: N-U, Greenwood Press, 1983. ^ "The Great Strike". The National Guardsman. New York: Charles A. Coffin. I (2 (Supplement)): 37. September 1, 1877. ^ a b "The Great Strike of 1877: Remembering a Worker Rebellion". UE News. June 2002. Retrieved May 25, 2008. ^ Singer, Merrill (2007). Drugging the Poor: Legal and Illegal Drugs and Social Inequality. Waveland Press. pp. 47–48. ISBN 1478610247. ^ Zinn, Howard (1995). A People's History of the United States 1492-present. New York: Harper Collins. p. 248. ISBN 0-06-052842-7. Retrieved October 5, 2009. ^ Cutter, William, ed. (1913). New England Families, Genealogical and Memorial: A Record of the Achievements of Her People in the Making of Commonwealths and the Founding of a Nation, Volume 4. Lewis Historical Publishing Company. p. 1841. Retrieved September 11, 2015. ^ a b Hitchcock, Frederick L. (1914). History of Scranton and Its People. I. New York: Lewis Historical Publishing Co. pp. 496–516. ^ "Hyde Park History". Retrieved September 11, 2015. ^ Logan, Samuel C. (1887). A City's Danger and Defense. Philadelphia: J.B. Rogers. ^ a b Cahan, Richard (2002). A Court That Shaped America: Chicago's Federal District Court from Abe Lincoln to Abbie Hoffman. Northwestern University Press. pp. 33–34. ISBN 0-8101-1981-1. Retrieved October 5, 2009. ^ Brecher, Jeremy (1974). "Strike!" (3rd ed.). Fawcett Publications. ^ Skrabec, Quentin (2012). The 100 Most Significant Events in American Business: An Encyclopedia. ABC-CLIO. p. 81. ^ McCabe, James Dabney; Edward Winslow Martin. The History of the Great Riots: The Strikes and Riots on the Various Railroads of the United States and in the Mining Regions Together with a Full History of the Molly Maguires. ^ Guide to the Baltimore and Ohio Employees Relief Association, Annual Reports, 1880-1918. Special Collections Research Center, Estelle and Melvin Gelman Library, The George Washington University. ^ Gilje, Paul (1999). Rioting in America. Indiana University Press. ISBN 0253212626. ^ Brown, Richard (1975). Strain of Violence: Historical Studies of American Violence and Vigilantism. Oxford University Press. ^ "Baltimore and Ohio Railroad Martinsburg Shops". National Historic Landmark summary listing. National Park Service. Retrieved October 13, 2007. ^ Michael Caplinger and John Bond (October, 2003) National Historic Landmark Nomination: Baltimore and Ohio Railroad Martinsburg Shops, National Park Service and Accompanying 18 photos, exterior and interior, from 2001 and undated. ^ "Great Railroad Strike of 1877". Historical Marker Project. September 15, 2014. Retrieved June 2, 2016. ^ "Roundhouses and Shops / Railroad Strike of 1877". Historical Marker Project. September 27, 2014. Retrieved June 2, 2016. Bruce, Robert V. (1959) [1st pub. 1957]. 1877: Year of Violence. I.R. Dee. ISBN 9780929587059. Mofford, Juliet Haines (editor). Talkin' Union: The American Labor Movement. Carlisle, MA: Discovery Enterprises, Ltd., 1997. Yearley, Clifton K., Jr. "The Baltimore and Ohio Railroad Strike of 1877," Maryland Historical Magazine (1956) 51#3 pp. 118–211. White, Richard. "Railroaded." W.EW. Norton, 2011. Wikimedia Commons has media related to Great Railroad Strike of 1877. "The Great Railway Strike of 1877 and Newspaper Coverage". Railroads and the Making of Modern America. University of Nebraska Lincoln. Retrieved September 1, 2016.